Kaelan just finished his Kindy years and as a parting gift his teachers prepared a book in which they had kept a selection of his drawings. It is absolutely fascinating to look through this collection of drawings and see his developing consciousness unfold as the year goes by. Using children’s drawings as a way to understand their development is a favourite subject of mine, and one I will write more about in the future I am sure. For now I would like to show you some of Kaelan’s drawings, both from his Kindy and ones that we have kept over the years. I will do it in parts, as I suspect all together an analysis of 3 years of drawings will be too long for a regular blog post! Every child knows what he or she has drawn, even if it is just an expression of movement, rather than an image from their experience of life or imagination. It is impossible for any adult to look at a child’s drawing and say for certain what is going on within their minds and hearts. There is loads of research into understanding children’s emotional, physical and cognitive development from their drawings, each offering slightly different ways of interpreting the images. There is, however, a general consensus that each child moves through the same stages of drawing at relatively the same time of life. Just like learning speech and just like learning to walk, all children of all cultures move through the same phases of drawing. 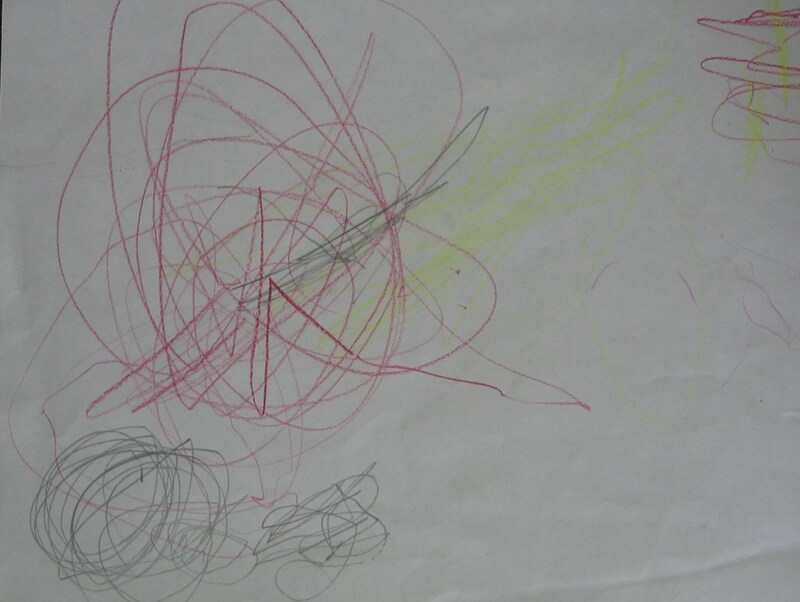 Here is the general type of drawing for children 2-3 years: a scribble. These are Rosella’s scribbles (thankfully on the BACK of the paper that Kaelan had drawn a masterpiece on!). Rosella is currently 2 years and 3 months old. Generally this is the way children first use drawing implements, and I believe it is partly due to the first hand-grip, which is with the pencil or crayon held firmly in the child’s fist, not allowing for a great detail of fine movement … but also because the child is not consciously aware of fine details at this age. Watching my children draw at this age, I could see that it was about the ACTION of the pencil, the movement in which the pencil becomes an extension of the child themselves. I have plenty of little scribbles on the walls and furniture of my house that attest to this. Little Rosella is quite pleased with the marks she has made in the world. 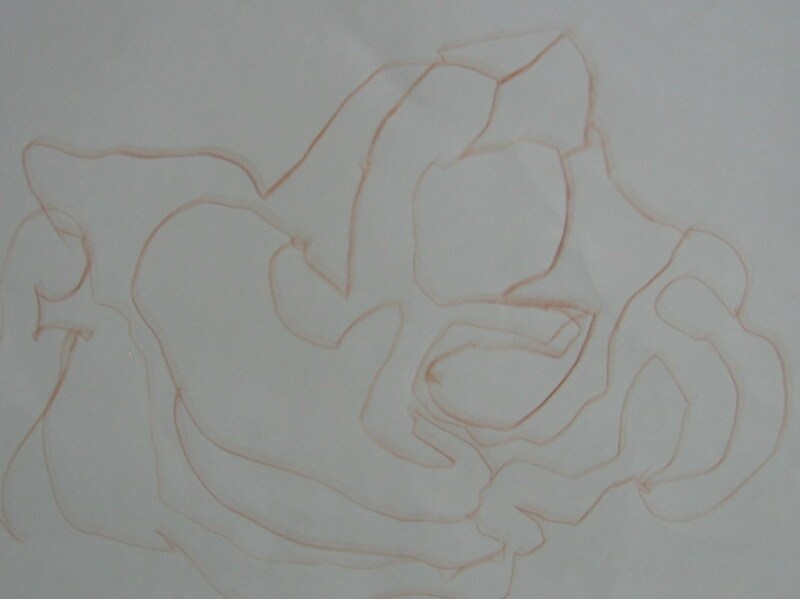 This ties in with the general school of thought regarding this stage of drawing development: that young children who scribble are not actively attempting to recreate the world as they see it, but are experiencing the action and feeling of drawing, and delighting in the results they have made. Their drawing is a gesture. In terms of interpretation, the field is open. There is another school of thought that the scribble represents the child’s connection to the cosmos, the spiraling energy of the world from which they came, and to which they are still very connected. I will call this INCARNATING INTERPRETATION, and will focus mainly on this school of thought throughout this post. Here we are in the realm of the revolving planets. It is a cosmic picture, clearly revealing the young child’s experience of ‘coming in’. [Hanns] Strauss shows these forms to be typical of children under three years – that is, before there has developed a clear awareness of their own ‘I-ness’. To begin with, there is still a oneness with the infinite, while at the same time, a seeking to come in, to find a centre on the earth. These drawings were accompanied by many sound effects and often were very enjoyable and very intricate. The next form of drawing that occurs is the straight line, and the cross, which I will discuss in another post. Thanlk you Jen for the informative post, really interesting and eye opening.